At the foot of the Nevada Convention stage. Image via Raw Story. In a turn of a events few predicted, the Democrats are now the ones worrying about convention chaos. 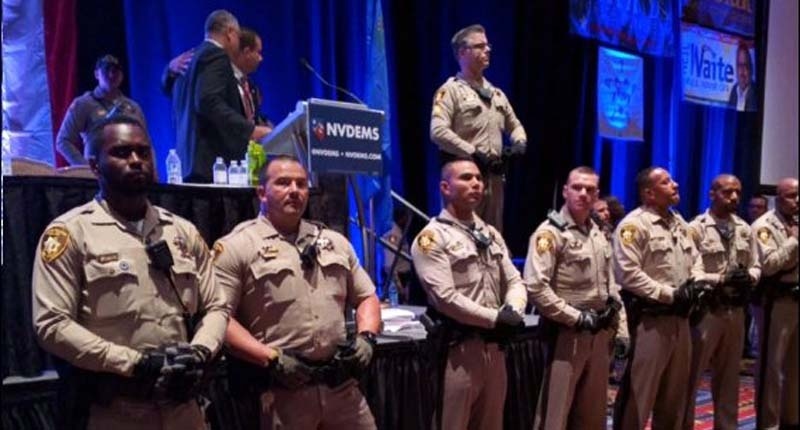 In the aftermath of their recent Nevada convention, where Senator Barbara Boxer was booed, claiming that “the future of the country is at stake. When you boo me, you’re booing Bernie Sanders. Go ahead. You’re booing Bernie Sanders.” Additionally, their own state party received death threats. Recently, party leaders met to discuss how to prevent this from happening again. However, all eyes are on Wyoming, where their convention may also descend into chaos, because despite Sanders’s convincing win in the state, Hillary Clinton will still walk away with more delegates. We write to alert you to what we perceive as the Sanders campaign’s penchant for extra-parliamentary behavior — indeed, actual violence — in place of democratic conduct in a convention setting, and furthermore what we can only describe as their encouragement of, and complicity in, a very dangerous atmosphere that ended in chaos and physical threats to fellow Democrats. Condemnation of Sanders’s response, which was, in part, “our campaign of course believes in nonviolent change, and it goes without saying that I condemn any and all forms of violence, including the personal harassment of individuals” continued from Senators Harry Reid and Tim Kaine (who is considered an almost sure bet for Hillary’s Vice President). The Nevada Democratic Party mostly refuted all of Weaver’s claims. That the state party changed the rules to “shut people out of the debate.” The rules, however, are essentially the same to those in years past and that the campaign expressed no formal concern to party leadership over the rules, the state party has said. That a voice vote of the convention was clearly a “no” vote. Two early votes of the convention were clearly divided between Clinton and Sanders supporters, who voted yay and nay, respectively. The Sanders supporters were arguably louder in shouting their “nays;” however, there were more Clinton delegates in the room, suggesting that the Clinton supporters and their “yay” votes should have prevailed. That there were not enough chairs for everyone at the convention. There was space for 4,300 people in the main convention hall, according to the state party, but only 3,358 showed up. That the state party refused to allow all of Sanders’ delegates to be seated. The state party said that of 64 potential Sanders delegates, only eight delegates showed up and attempted to register at the state convention, and six were seated after investigation. The remaining 58 delegates had failed to provide missing identification information or were not registered Democrats by May 1. Additionally, the credentials committee, the body charged with looking into delegate issues, was made up of five Clinton and five Sanders supporters. What does all of this mean for going forward? It suggests that the Democrats are in for a messier convention this summer than they had thought even a few weeks ago.